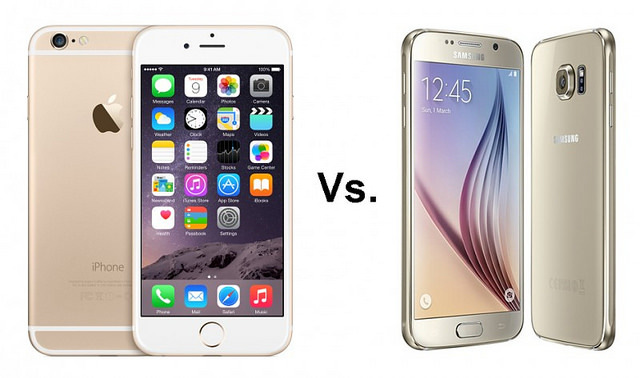 Despite what many are seeing as subtle variations between the iPhone 6 and Samsung Galaxy S6 smartphones, it is evident upon more in-depth scrutiny that the two warring devices have huge differences, which might dictate your buying option. The two flagships, which would certainly be the talk of the town this year (unless either Apple or Samsung surprises us with a new product), admittedly have similarities that should come as a compliment, well, for Apple only because it debuted its product first. These similarities are subtle, from the curved aluminum edges to the protruding rear camera. For those who might be planning to purchase either of the two products sooner or later, these are some of considerations to influence your decision. Higher camera power. The Galaxy S6’s imaging capability promises better resolution than the iPhone 6, with its 16-megapixel rear camera and 5-megapixel front camera for the selfie addicts. The speed must also be taken into account, for the Galaxy S6’s camera shoots at faster snaps that you won’t experience a lag in the shutter. What’s more, the camera is easy to open, you just have to double-tap on the home button and the camera launches quickly even when the phone is locked. Speaking of resolution, the Galaxy S6 has a bigger pixel resolution, a 577-pixels-per-inch screen compared to the iPhone 6’s 326 ppi display. That means Samsung’s 5.1-inch AMOLED 2 display for its flagship is second to none. And with that pixel reso, the display looks like a 4K ultra-high-definition, more HD than the usual HD displays we see today. The Galaxy S6 is also capable of wireless charging with a dedicated wireless charger, just like many Android phones. That is something you won’t find in Apple products. It remains a puzzle why Apple has not added yet the same feature to its latest family of iPhones. Samsung’s flagship has also got a turbo charger that’s extremely fast. The iPhone 6, on the other hand, boasts of its rich and more secure app ecosystem. Android has been recently the subject of headlines about malicious apps. Google’s Play Store does not lack for it, as we have reportedly just lately. And since the iOS ecosystem is far more unified and streamlined than the fragmented Android universe, it’s easier for developers to publish their apps first for the iPhones and iPads. The iPhone devices may lack the large components found in the products of Samsung, but what it lacks on the hardware side it compensates with more fresh and secure apps.